Start spreading the news... Yes, yes we're just a couple of days away from William and Kate's visit to New York and Washington DC (for Prince William). There is a tremendous buzz surrounding this trip similar to one we would expect for a full royal tour. In this post we'll be looking at stories surrounding the visit and sartorial possibilities for the trip. Firstly, Kensington Palace released the full programme for the Duke and Duchess' visit - a nice refresher for those who would like another look at the itinerary with notable additional information. 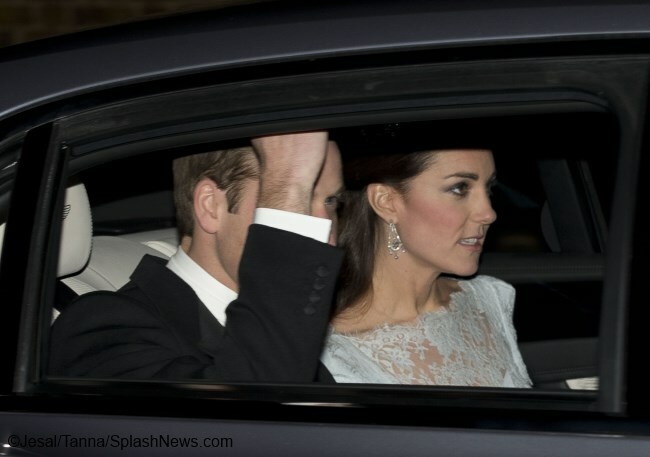 The Duke and Duchess of Cambridge arrive at their hotel in New York City. 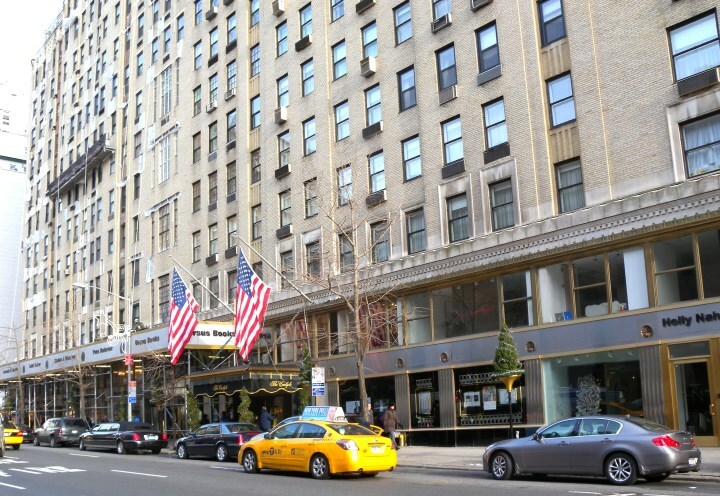 As you may have heard they will be staying at luxury hotel The Carlyle on New York's Upper East Side. The hotel has royal links: Princess Diana first visited in 1980's and it became her residence when she visited the US after that. 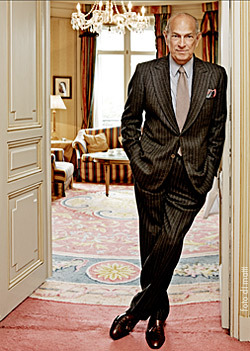 Other familiar faces who stayed at the hotel include John F. Kennedy Jr. and Diane von Furstenberg. We expect to see arrival/greeting photos from the hotel shortly after the couple touch down in New York. That evening they will attend a private dinner being hosted by the American Friends of the Duke and Duchess of Cambridge and Prince Harry. There's always the possibility of arrival/departure photos from the (undisclosed) location of the event. The Duke of Cambridge will be received by President Barack Obama in the Oval Office at the White House and later will also pay a call on Vice-President Joseph Biden. We had hoped there would be an opportunity for William to meet with the President and it's wonderful to see it's been manageable considering his very full schedule. 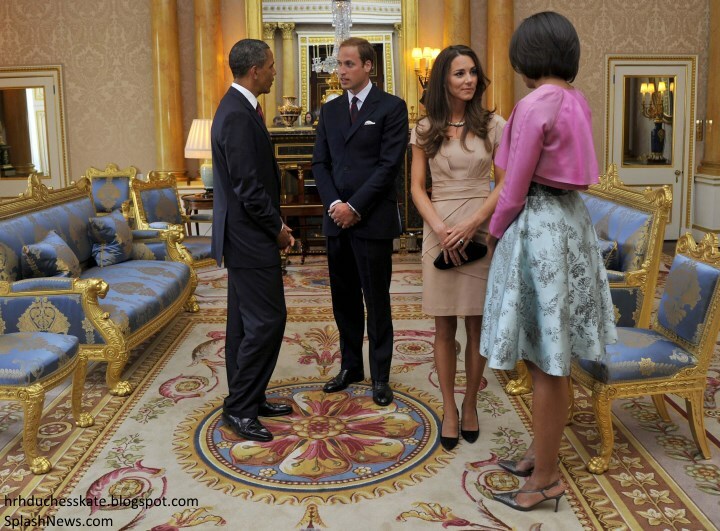 Readers will recall William and Kate met the Obamas in 2011. The Duke of Cambridge, accompanied by the Right Honourable William Hague, will attend the International Corruption Hunters Alliance conference at the World Bank in Washington. The Duchess of Cambridge, accompanied by the First Lady of New York City, visits Northside Centre for Child Development in Harlem. The child development centre fosters the healthy development of children and families by providing high-quality mental health and educational services. 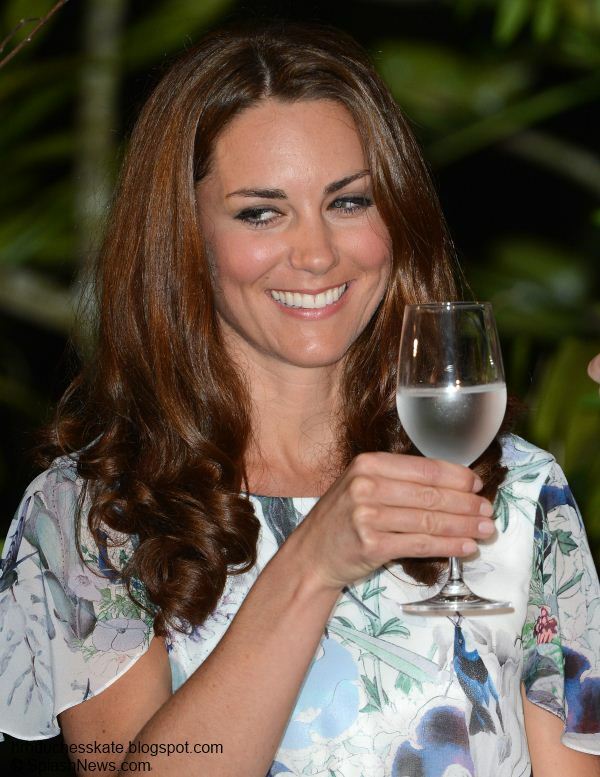 The Duchess of Cambridge will attend a lunch at the British Consulate General in New York. The Duchess will meet members of the British Community in New York from culture, arts, hospitality and business sectors. The Duke of Cambridge, accompanied by Hillary Clinton and Chelsea Clinton, will attend a Conservation reception at the British Consul General's Residence, New York. On his return to New York, the Duke will attend a reception organised by the Royal Foundation, in recognition of the conservation work carried out by Tusk and United for Wildlife partners, Wildlife Conservation Society, Conservation International and The Nature Conservancy. The Duke and Duchess of Cambridge will attend an NBA match (Brooklyn Nets v Cleveland Cavaliers) in Brooklyn. The partnership between United for Wildlife and NBA Cares aims to use the huge global reach of the NBA to help raise awareness among a younger generation of the negative effects of purchasing illegal wildlife trade goods. There are still tickets available for the game should any of you wish to go. The Duke and Duchess of Cambridge will visit the National September 11 Memorial Museum, New York. This is perhaps the most notable addition to the calendar. We knew the couple would be visiting the museum, however, we didn't know when and if would be a private occasion or one covered by the press. It appears a select number of the press will be there to cover the very important commemorative engagement. The Duke and Duchess of Cambridge will visit The Door/CityKids, New York where they will see the work they carry out in partnership with the CityKids Foundation. Both organisations focus on programmes and projects that promote youth development and social learning. The Duke and Duchess will learn about the wide-ranging support services on offer to young people to help them reach their potential, particularly through an arts-education model that supports the artistic and intellectual development of the participants. The Duke and Duchess of Cambridge will attend the Creativity is GREAT reception, hosted by NeueHouse, New York. The reception will be hosted at the membership work collective NeueHouse, in association with the UK Government's GREAT campaign. The Duke and Duchess of Cambridge will attend the Innovation is GREAT reception, hosted by Shutterstock at the Empire State Building, New York. The event will bring together entrepreneurs from the UK and the US. UK Trade & Investment (UKTI) works closely with this community, and launched the GREAT Tech Awards in 2013. The Duke will have the opportunity to present this year’s winners, who will have recently returned from a week-long business-development programme in the UK, with their GREAT Tech Awards trophies. 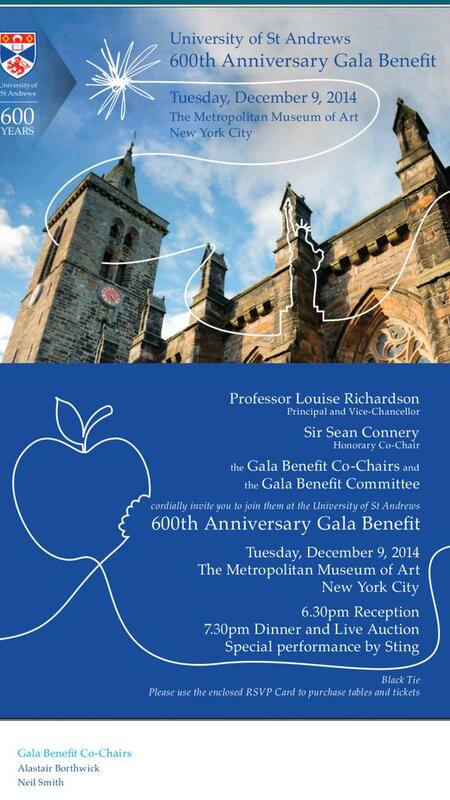 The Duke and Duchess of Cambridge will attend the St Andrews 600th Anniversary Dinner at the Metropolitan Museum of Art, New York. The event will support scholarships and bursaries for students from under-privileged communities, new student sports facilities in St Andrews, investment in the university's media and science faculties and a lectureship in American Literature at St Andrews. This will be the glittering red carpet engagement of the trip. What will Kate wear for the trip? The Duchess will need at least two outfit changes per day. Considering the climate of the event I think she'll pack warm but stylish coats, perhaps a coatdress, stylish fitted dress and a 'Wow' evening gown for the St. Andrews dinner. We can expect to see her favourite designers including Alexander McQueen, Jenny Packham and Temperley London with a nod to her host country in something by a US designer. I've thoroughly enjoyed looking through potential labels - particularly Marchesa. British-born Georgina Chapman and Keren Craig met at Chelsea College of Art and Design in London and their creations resulted in the creation of Marchesa (named after socialite Marchesa Luisa Casati) in 2004. The brand's headquarters is in New York and their clothing is sold worldwide and online at Net-A-Porter, Saks Fifth Avenue and Neiman Marcus. The beautiful One-shoulder draped silk-gazar gown, the Embellished lace and tulle gown and the Off-the-Shoulder Silk-Chiffon Gown in such a beautiful shade of green. 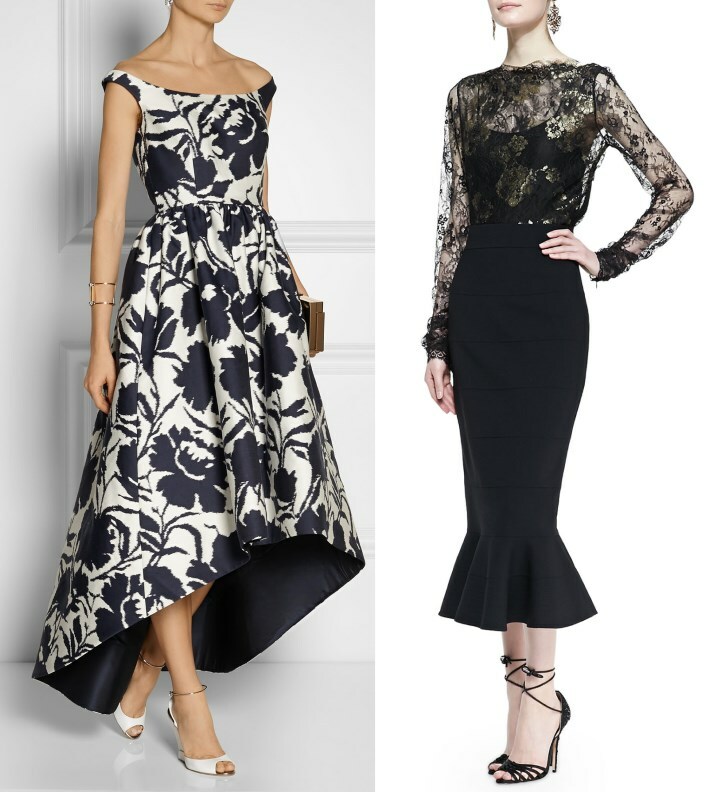 (All of these gowns are on sale with up to 50% off at Net-A-Porter). Marchesa's gowns scream 'Princess' and were made for royalty. 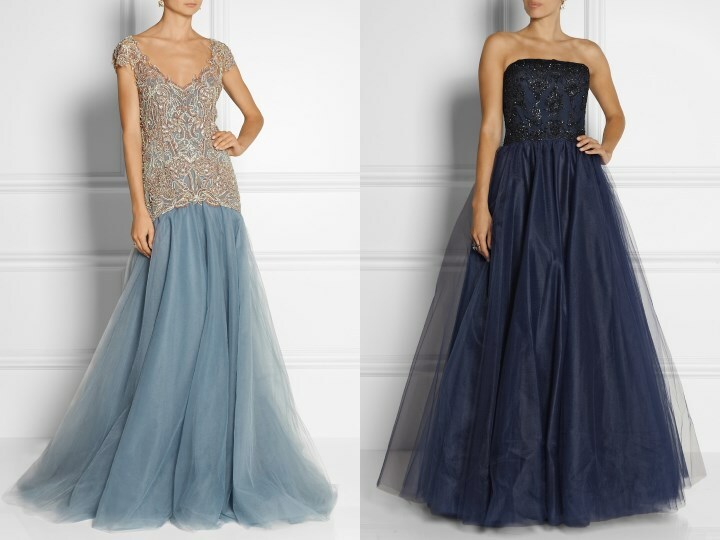 Two such gowns (which would be something of a departure for Kate, but hey we can dream) are the Embellished Tulle Gown and the ethereal embellished tulle gown. The level of attention to detail on Marchesa designs is incredible and very much evident in the Floral and Lace Mermaid Gown. Crafted with floral underlay and accented with beading on the bodice it's a very striking piece. 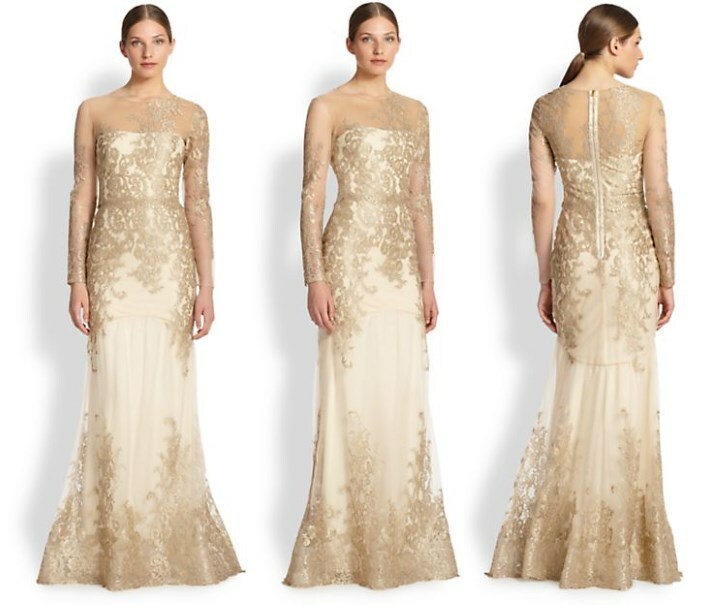 Marchesa's diffusion line Notte by Marchesa offers endless droolworthy possibilities. Shall we look at more gowns? (I think so...) The Sleeveless Beaded-Neck Column Gown, the pretty pink Illusion-Neck Gown and the divine Tiered Flower Applique Gown. Another designer I thought of immediately was Oscar de la Renta. The ever-popular Dominican-American designer sadly passed away earlier this year, however, his legacy will live on for many, many years to come. He's something of a favourite among the European royals including Princess Mary, and the brand would be a great choice for Kate. The 3/4 Sleeve Cardigan & Floral A-Line Dress, the Sleeveless Dotted Dress, the Rose-Print Cropped Cardigan and Striped Waist Dress and the Vibrant Red Princess Coat. The Off-the-Shoulder Floral Print Dress and the Metallic -Embroidered Lace Blouse & Midi Skirt are very elegant ladylike looks. 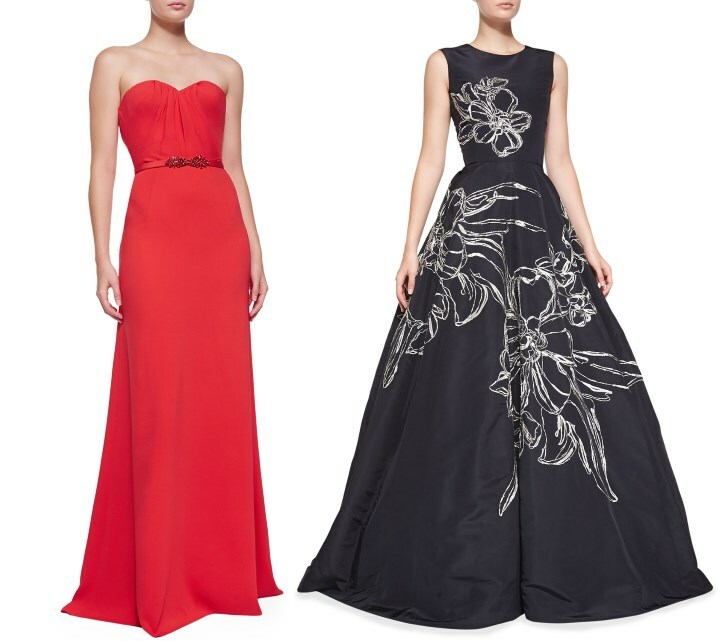 For evening gowns, the Strapless Sweetheart Gown and the Floral-Embroidered Ball Gown are both fabulous garments. A number of the garments shown in this post are seriously discounted in the Net-A-Porter US Sale. 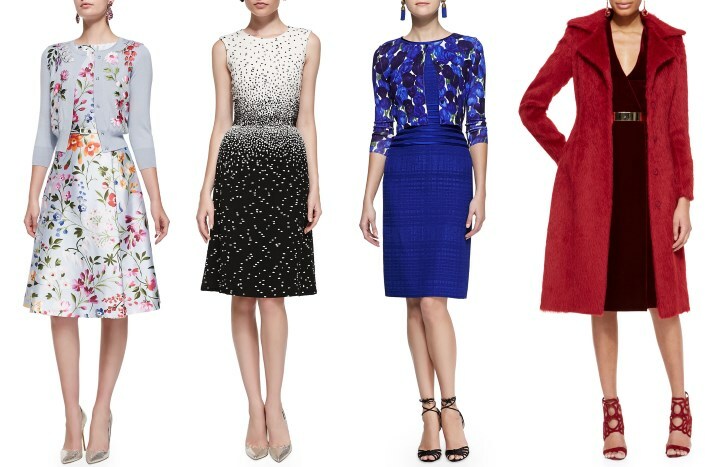 There's up to 50% off a wide selection of Kate designers. Should Kate choose to repeat an evening gown, I do very much hope she selects the lilac bespoke Alexander McQueen gown she wore to the annual Diplomatic Reception last year. We never did see the dress properly, but from what we could gauge it looked stunning. What gown would you like to see again? Speaking of the Diplomatic Reception, it took place earlier this week. Photographers were waiting outside the Palace, though unfortunately William and Kate were not there this year. Finally, on Thursday Kate attended a board meeting and reception for her newest patronage, sailing charity, the 1851 Trust at the Goring Hotel. The Duchess attended the launch of Ben Ainslie's America's Cup bid in June. It was a private event and no photographs have emerged. Of course, royal fans know Kate and her family stayed at the Goring the night before the wedding, and no doubt the evening brought back many happy memories for her. Their trip is shaping up nicely. Exciting times, I wish they would spend more days in the USA. I love the designers you chose, stunning gowns all of them. I hope she wears sth ODLR it would be a nice bow. Personally I think she wont repeat any items, partly because she is putting on more andmore weight and partly everybody expects her to look amazing. I am sure she will. I must check the time difference, and I look forward to your posts Charlotte. London is 5 hours ahead of us here in NY. That means that for a pregnant Duchess those evening events will be a challenge. When it's 9 pm here - it will feel like 2 am for the Duchess (on London time). I hope they factored that into her schedule - leaving time for sleep! Thank you for all of this information, Charlotte. I will be watching with great interest as always. I think the designs you've showcased are stunning and all would look wonderful on the Duchess, but I'm sure we will see a significant jump in baby bump so that will impact her choices I'm sure. We will soon see. I can't wait. Wonderful information packed post, Charlotte, thank you! 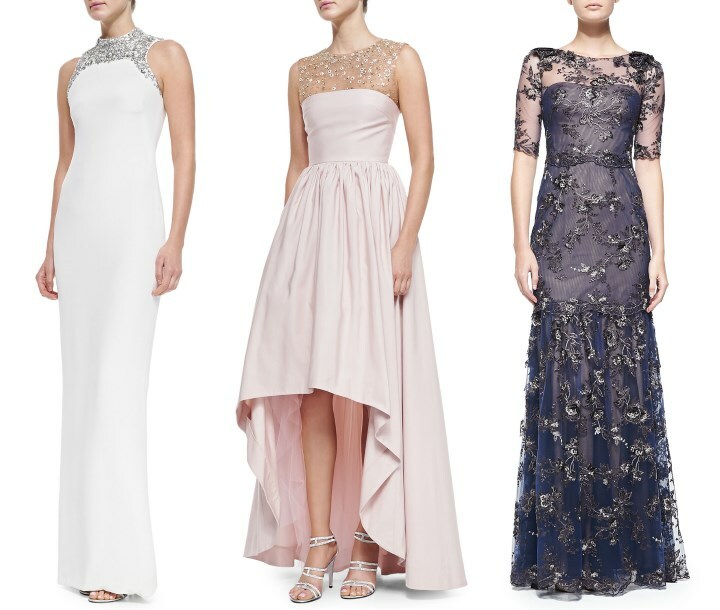 Love the Marchesa looks in particular. Shocking prices on the St Andrews gala. For that sort of money, you'd think we'd get a tiara. I hope the Duke and Duchess feel very welcome here and enjoy their whirlwind visit to the States. Am I correct, Charlotte? I believe tiaras are reserved for state occasions. Charities, no matter what the cost of the tables, don't rate that level of bling. Plus, if you're going to fly to NYC to press hands and raise funds at a very busy time of year, you'd better get something more than spare change out of the deal. Charlotte is doing a fantastic job! Philly - You are correct. The only occasion we would see Kate in a tiara would be a white-tie event, the glamorous event of this trip is black tie. A jest, ladies, ye gods. Rain making you, cranky, Philly? Saint Andrews alums of more modest means are unhappy with the high prices. Not the least bit unhappy, Graybird K. Why would I be? I can understand the unhappy Saint Andrews Alums; however, being strictly pragmatic and keeping emotion out of it, the sensible thing to do is to attract the American glitterati who have the deepest purses. These charity things are like that. Modest purses need not apply. Call it Social Darwinism. At least with social media we get to look in from the blogosphere and enjoy it vicariously. I'm very happy. Yes, but I'm afraid it may not fit--we have no idea about the cut of its waistline, do we? Full programme, but I am glad they have left a late afternoon space for Catherine to rest--or get her hair done. The gowns you show are lovely, but possibly not wearable at this stage of her pregnancy and that might apply to the gown she wore last year. I sure hope I get to see them while they're here! Fingers crossed! Great post Charlotte, love the ODLR dresses, sure she will look fantastic whatever she wears! Any clues on what flight she on or timings ? What a great outline of their itinerary. :) I look forward to the coverage of W&K's visit. Ohhh...I love the Marchesa gowns. They are very pretty and feminine. But I tend to think we won't see a recycled gown. First, because of limitations due to her pregnancy and, second, because I think there's a certain expectation of a new "wow" piece for their first visit to the Big Apple. I'd love to get a proper look at that McQueen gown. It's a good chance as the McQ was worn last December so we know it's weather appropriate. Are you sure it's lilac? The pictures look more mint or light teal to me. Either way, they're all beautiful colors. Emily, it looks more gray or a *very* light gray/blue on my monitor. :) I hope we find out at some point, but I don't think we will see it on this trip given her pregnancy. It's lilac. The pictures I saw in the L.A. Times showed the color better than those online. this may be a strange question but I just wonder is William flying to DC because that's a long trip!? From NY, DC is about 45 minutes by helicopter, 4 hours by train or car. Most likely he's booked a helicopter to get to and fro. That is not unusual for the wealthy or executives in business. It is under a 4 hour drive. Flying will be around one and half hours. It's about 5-6 hours by car (depending on traffic). There is also a fast train to get there. However there are many daily "commuter" flights that are about 45 minutes (I think?). It's only 250 miles from NYC, and a short "hop" flight. About 35 minutes. He'll be landing as soon as he takes off!! You hardly have time to have a cup of coffee!! Can't say I'm overjoyed that William "gets" to visit our sitting president. Not many of us are that proud of him. The White House is spectacular though, although probably not compared to Buckingham Palace! I used to work in DC. and had friends who worked in the White House. One of them got me into the Oval Office one time when the Pres. was away (not Obama!). It'l lovely, but a lot smaller than you might think. Washington is a lovely city, architecturally, though, and I'm sure William will find it interesting! It was designed by a Frenchman, Pierre L'Enfant, and many people compare it to Paris. It's not far, quite a short trip by air. It is the quickest method. The fast train is about 3 hours, I recall. National Airport gives quick access to downtown DC. Most likely. There are a lot of regularly scheduled flights from NYC to DC. Jane franks...I respectfully agree. I hope prince William finds what he is seeking, and at bare minimum, be afforded the respect and grace given to a Visitor. Blessings all around. I would expect, for the sake of security as well as scheduling and especially given the protests that have cropped up all around that he's being flown by helicopter to and from NYC. Actually, there are many of us who are very proud of our President! Jane, please speak only for yourself, and really politics is inappropriate here. Queen so we should respect that. I just wish Kate was attending with him but with the things she has to do and then the game that night I am sure William wants her to take it easy and not over due it. I'm quite proud of our president, thanks! No matter which political party you side or whatever your choice and/or bias, if you like your country, you need to be considerate that the president (whoever he might be) represents some good percentage of your fellow citizens. William, however one likes him for whatever the reasons has much less if any influence on your country’s people. What makes this blog a break from the rest is partly its refreshingly different culture (civil, less envious, rational, arts, history and fashion) of blogging and participating. I don't think Jane's comment was out-of-bounds in a post that refers to William meeting with Obama and Biden. Quite frankly, our leader could use some positive press right now. "Can't say I'm overjoyed that William "gets" to visit our sitting president. Not many of us are that proud of him." Jane, that just seems incredibly insulting to me. Regardless of if you agree with the president, he is the President of the United States, and deserves some respect. And certainly more respect than Prince William, who, unlike Obama (who worked very hard to get to his position), is in his position solely because of a lucky birth. Not saying that William doesn't work hard, but the idea that it isn't an honor for William to get to spend time with a very busy, very important man is mind-blowing to me. I am concerned that nobody mentions that Sunday is Pearl Harbor Day in the US. While not a national holiday, flags are flown at half-staff in tribute to the thousands who were killed and injured on December 7, 1941, in service to our country. I hope that Kate and Will will at least acknowledge the date, since it marks the anniversary of the United States' entry into World War II in active alliance with Great Britain. I will consider it a real faux pas if they ignore the day. Lynn, agreed! While the UK had been at war for several years before 12/7/41, that marked the entry of the US into World War II and the start of the alliance that would defeat Hitler in the West and Hirohito in the East. It's entirely appropriate that Will and Kate at least give a nod to this important day. I'd also hope that everyone keeps the focus on the 9/11 Memorial and the lives that were lost that horrific day and the US and UK lives that have been lost since in the War on Terror. I can't think of anything more inconsequential or vapid than what designer a bored British aristocrat wears to visit that sacred site. What exactly do you suggest they do? What is it that you do to honor the day? They are not doing any public engagements this day so I'm not sure I understand what you want from them. William is paying a call to both the President and the Vice President one day and visiting the 9/11 Memorial another day. I am comfortable that he is meeting his diplomatic obligations. There is a Queen and a Prime Minister who can send their official regards to the US on Pearl Harbor Day. I'm with Moxie on this one. When I was in school, we always had an observance in assembly--my minister in church this morning acknowledged the anniversary. Flags are flown at half staff. There were articles in the papers about the 73rd anniversary. If William makes any public statement at all, today or tomorrow, I think he should acknowledge it. It does not have to be a great big dramatic deal, but I don't think William should ignore that the day coincided with his and Kate's visit. He could deliver the Queen's or the Prime Minister's regards in person. The fact that he is visiting the President and Vice-President in Washington does give the visit some official and diplomatic significance. Furthermore, he and Kate are doing the 9/11 memorial. What is wrong with some mention of Pearl Harbor? --even if he makes it in a press release. Those gowns!!' I am drooling!!! A wonderful post as always. My goodness - they do seem busy! Almost too busy for a pregnant woman! That is a lot of events in one day. When will the Duchess even have time to get ready for the night events? I'm here in New York City and it will be in the 40's temperature-wise (fahrenheit) so expect to see some great coats during the day! We have had a lot of protests here this week - all the bridges were shut down to the city Thursday night etc. - but our wonderful NYPD will keep them safe. Very excited to see William in the oval office with out President. President Obama was very grateful that when Michelle Obama and his daughters went to London (once without him) Queen Elizabeth arranged a carriage ride for the girls in the inside of Buckingham Palace! President Obama seems to have very warm feelings for the Queen. It will be a fun few days - but so many events! Yikes! Charlotte, I love the Marchesa gowns as well. And agree, an ode to ODLR would be amazing. She's worn Michael Kors and Tory Burch. We've seen casual clothes from Ralph Lauren. I'd like to see Vera Wang and Donna Karen as possibilities. So excited! I do hope we get to see everything she wears including the private events. Hope she shows off her baby bump versus hides it. Quick question for Charlotte, or any fashionista who knows... The Marchesa "diffusion line" is mentioned in this post. What is a diffusion line? Thanks for another fun, informative post! I can't wait to see the Duke and Duchess in the States! Bluefire, our thoughts are with the people of the Philippines, and we hope the typhoon will pass quickly and those who have fled will be able to return and rebuild their lives. Good luck to you! Just a silly thought in the middle of the night. If they are visible at the game, I wonder if they will be targeted by the kiss cam. And if they are, would they kiss? :P Thoughts? Will they have opportunity to see Eugenie? Doesn't she live in NYC? The evening gowns ������are divine and IMHO Kate would look lovely in many of them with her growing baby ! "William and Kate will sit court side during second half of Nets game tomorrow night"
I simply can't wait! Feeling so excited about this visit. Me either! Getting some butterflies now! Hello it's already 5:15pm. Did they arrive yet??? I am immensely excited! !!!!!!! Wow, Kate is looking so beautiful in this meeting. Look at the meeting rooms, its wonderfully designed. I wish I could attend such royal meetings in my life. Anyways Barack Obama is one of my favorite president. Most of time I listen his speech, and every time I learn new thing from them.